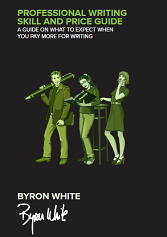 Byron keeps the content marketing ideas going and books flowing to readers and fans, making it easy for anyone to join the content marketing revolution and grow business organically-- the content marketing way! Learn the essential tactics, tips and strategy for Content Marketing—the art of the art of listening to your customers' wants and needs, and the science of delivering it to them in a compelling, engaging way. All the fundamentals are covered, ranging from content planning, creation, optimization, distribution and performance measurement. Buy it on amazon, or download it for free! What should you expect when you pay more for writing services? Byron offers the answers in his second book that breaks down the elements of content quality including skill and proficiency requirements, complexity, visibility, transitions, analogies, word choices, cohesiveness, creativity and more. It's a great resource for both writers and buyers of writing services, helping everyone get on the same page when it comes to quality and price. 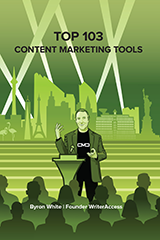 This book hopes to enlighten you on the top content marketing tools on the planet. Each content tool is hand-picked and vetted for performance. We also scoured the social sphere for user feedback and concerns. And wrapped it all together in a book that we hope guides and enlightens you while selecting the best tools for you and your team members.